The parahydrogen induced polarization (PHIP) method is based on the non-Boltzmann distribution of nuclear spin states following the hydrogenation of a substrate by parahydrogen. Absorptive and/or emissive NMR signals can be greatly enhanced, up to several orders of magnitude as compared to thermally polarized molecules. The research in this field is part of the expertise of LSDRM in its effort to increase NMR sensitivity. Dihydrogen, initially made of 1/4 of parahydrogen and 3/4 of orthohydrogen, a proportion that does not induce any hyperpolarization, is cooled to -196°C in the presence of a ferric catalyst, thanks to an home-made apparatus. The resulting gas contains about one half of parahydrogen, and may be use to obtain hyperpolarized spectra. A first example: the method named "signal amplification by reversible-exchange" (SABRE) is used here to increase the aromatic signals of N,N-dimethylnicotinamide. In SABRE, a catalyst reversibly binds dihydrogen and the aromatic molecule. SABRE hyperpolarized UF-COSY of a mixture of 5 substrates. 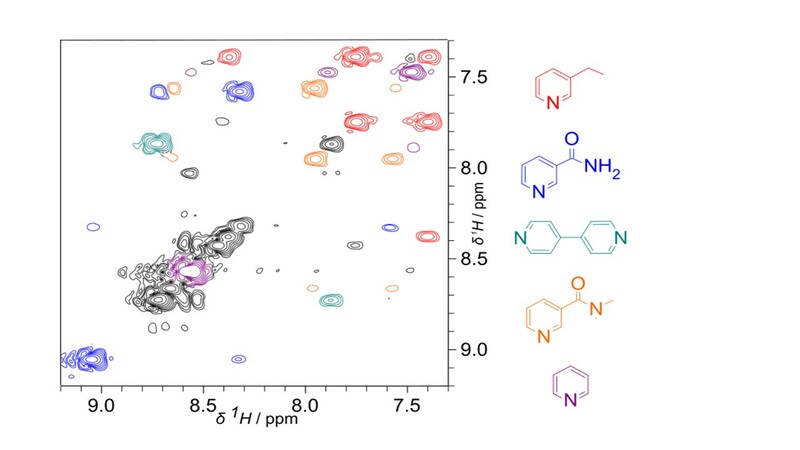 In a collaboration with ICSN, Gif-sur-Yvette, we show that a sub-millimolar mixture of pyridine derivatives can be distinguished thanks to SABRE and spatially-encoded NMR techniques. A COSY spectrum is recorded in less than one second, by combining SABRE to hyperpolarize NMR signals and ultrafast acquisition (UF) of a 2D spectrum in order to boost the spectral resolution. In this way, the inherent loss of sensitivity originating from the UF concept is compensated by the SABRE method. The full experiment, including parahydrogen enrichment preparation and transfer into the NMR tube, takes 5 minutes. Left: 1H spectra of a cryptophane immediately after irreversible addition of parahydrogen (green) and 6 minutes later (blue). 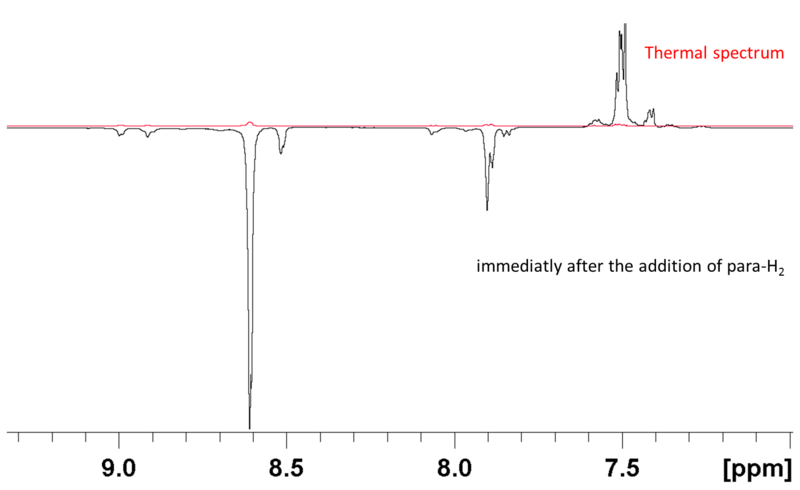 Right: 129Xe NMR spectrum of a mixture of cryptophanes hydrogenated or not on the non-aromatic double bond. Molecular probes that can be adressed by NMR with two different nuclei have been conceived. 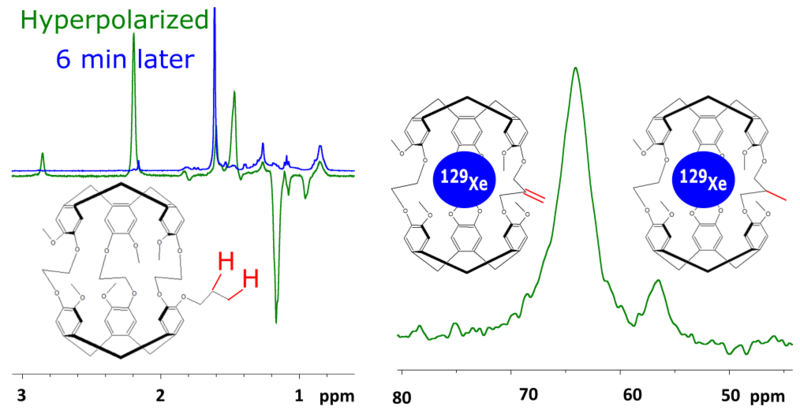 Hyperpolarized 129Xe NMR and PHIP 1H NMR provide two ways to locate the probe and to detect its hydrogenation , thus resulting in sensitive and complementary detection tool. Three cryptophanes bearing a tether with an unsaturated bond were tested. For one of them, the hydrogenation of the double bond induces a high 129Xe chemical shift variation. It can therefore be considered as a smart probe of hydrogenation. However, the hydrogenation is too slow to induce 1H hyperpolarization . For the two other studied cryptophanes, some 1H signals are enhanced while 129Xe chemical shift is essentially not modified. Modifying the design of the molecule is the next step to build valuable dual and smart probes. Hyperpolarized 1H EPI axial image of a tube immediately after the transfer of parahydrogen (left) and 40 seconds later (right). 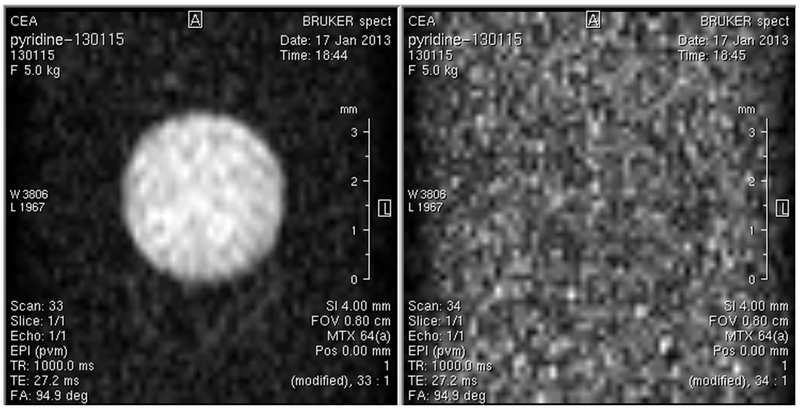 Fast MRI based on the SABRE method may also be obtained, here illustrated with pyridine at 40 mM in methanol.